Owning a swimming pool can provide hours of enjoyment and entertainment for your family. Unfortunately, many people, especially young children, are injured or die in pool–related accidents every year. Swimming pool accidents include diving accidents, water contamination, and drowning. As skilled Chicago personal injury lawyers we have handled many cases involving swimming pool accidents. Drowning accidents comprise the largest type of injury or death due to swimming pools. However, numerous other types of serious injury and death other serious injuries do happen in or near the water. A drowning can happen almost instantly. Barriers and pool fencing are vital to prevent children from gaining access to the pool area without permission. Property owners are responsible to provide a safe swimming environment for children and adults. Public pool rules are required to post pool rules in a visible location. The rules are to warn swimmers of the dangers of running or diving in shallow water. In addition, public pools are required to post signs regarding the status of available lifeguards. 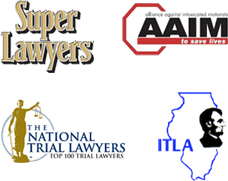 If you or someone you love has been injured in a swimming pool accident in Chicago or anywhere in Illinois due to another's negligence, the Chicago swimming pool accident lawyers at Nemeroff Law Offices are here to help.